I hope you all had a great long weekend- we had the best time in Vermont skiing with friends. One of the biggest ironies for me about skiing, though, is that in order to engage in an activity that is by nature so graceful and fluid, you have to dress up like an Eskimo and clumsily lug a bunch of unwieldy equipment while wearing impossibly stiff plastic boots. In all of that, it's a miracle if you don't lose a hat or mitten (or nearly decapitate a passerby). A few years ago, I finally figured out a way to carry all that stuff semi-gracefully. I call it the "suitcase" method, and it doesn't require any special straps or skills. First, stack your skis with their bottoms together. Then slide the wrist-strap loop of one pole over the tips of the skis, and the wrist-strap loop of the other pole over the ends of the skis. Then stick the tip and "basket" end of the poles through the loops on the opposite end, forming a handle. Grasp the poles toward the middle, finding the balance. Voila! 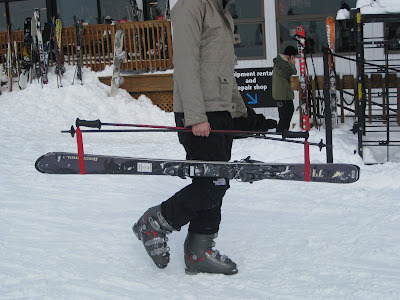 Now you can carry your poles and skis with one hand, like a suitcase (or rather, a suitcase made out of skis). You can also attach your boots together by their straps, and carry them over your shoulder. That leaves you with one hand free to carry your face mask, helmet, gator, foot warmers, glove liners, extra socks...well, you might need to bring a real suitcase, too. LFH, I love you to pieces, but I have to talk to you about the suitcase method. The suitcase is something every skiier has assembled at least once in his/her life. Perhaps it was alone in the basement; perhaps it was brazenly done in the middle of a ski resort. Regardless, this brilliant manoeuver is decidedly uncool (although that alone may be a reason to do it).